Will SkyCam’s SkyCommand Transform Live Sports Production? 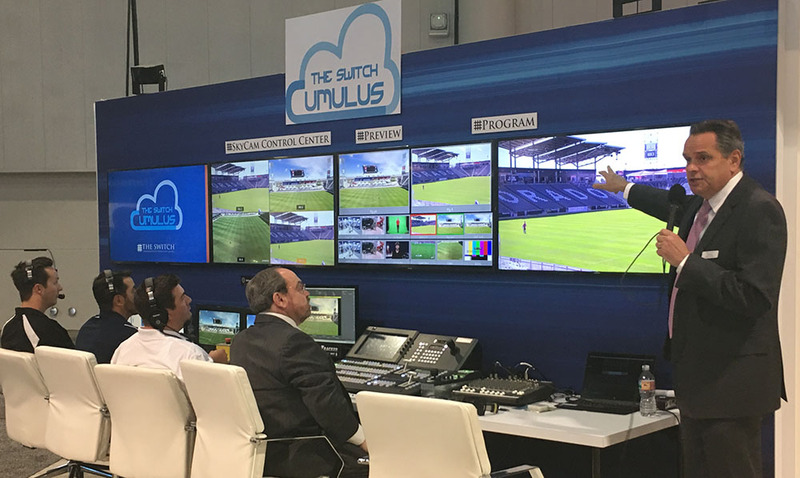 In a demonstration at The Switch NAB 2017 booth, SkyCam pilots and operators controlled a SkyCam in Denver from the show floor, and that feed was passed to a Switch control room in New York. It was one of the must-see events at the show. Less than a month later, ESPN put that demo to the test at the World Lacrosse Championships, and SkyCam CTO Stephen Wharton and the team were extremely happy with how things went. The Switch’s Richard Wolf (standing) demonstrates remote control of a SkyCam system via Cumulus cloud-based live production. “The ESPN broadcasts allowed a full vetting of our SkyCommand technology and the The Switch’s Cumulus Network as we spanned the entire U.S., at just over 3,000 miles with our feed supporting two simultaneous broadcasts,” Wharton says. During the broadcast, the SkyCam pilot, Cody Taylor, was located at Gillette Stadium in Foxborough, MA, and Darrin Haggard, the SkyCam operator, was located at a Switch control room in Los Angeles. He was fed video using J2K compression at 130 Mbps as well as the program feed so he could see graphics placement. According to SkyCam President/CEO Endre Buxton, SkyCommand creates a new business opportunity for the company. Historically, the use of SkyCam has been relegated to big national shows with big budgets. SkyCommand cuts the required team that has to travel to the show from four or five to two or three because the operator and pilot control the camera and rig from a remote location (the pilot flies the rig while the operator controls the camera). The travel and operational efficiency and cost savings mean that SkyCam can be a reality for Tier 2 events and Tier 2 networks. Both the demonstration at NAB 2017 and the first on-air use by ESPN relied on The Switch. The demo was sent to a control room in New York, and the pilot/operator team for the ESPN show operated from a Switch control room in Los Angeles. SkyCommand can be deployed at any point-of-presence on The Switch network or other networks because it is agnostic to the underlying transport network. Therefore, the potential ways in which it could be deployed are seemingly limitless. For example, when NBC Sports has its two primetime NFL games on Sunday and Thursday, the SkyCam pilot and operator could be located at any location on the network or at a spoke off the network. Or they could be at the stadium for the Thursday game and stay there for the Sunday-night game rather than travel again. With more and more mid-level productions making the move to at-home workflow, the ability to at least consider using SkyCam becomes a reality. Helping with that is the Clear-Com LQ system, which provides both PL communications, enabling the SkyCam team to talk to the production team, and RF communications, allowing the staff on the ground to be aware of where camera carts are and other things that affect the flight of the system. Also helping is that delays are only 30-80 ms, quick enough to not affect the twitchy muscle reaction times that are key to successfully piloting and operating a SkyCam.